While traveling recently through Atlanta airport, I saw a woman wearing a tee shirt that read, “Humpty Dumpty was pushed.” I laughed when I first saw it, thinking it was cute–well sort of. I truthfully have an aversion to women wearing silly phrases across their chests, but perhaps that is fodder for another blog. 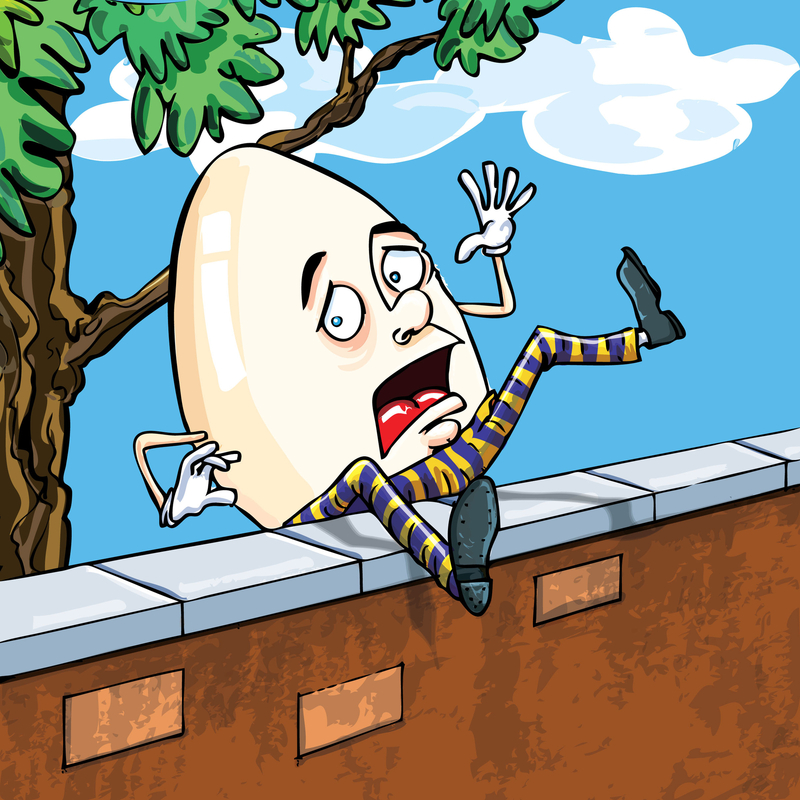 But I kept thinking about the message claiming Humpty Dumpty did not fall because he was distracted and forgot he was sitting on a brick wall, or due to poor balance. I wondered who wrote that message—Was it Humpty Dumpty himself trying to put the blame on another to avoid his embarrassment? Or, was it written by his mother who cannot believe that after all these years people are still talking about the incident? I don’t know if Humpty fell as the rhyme indicates, or was pushed, nor do I really care because it is just a nursery rhyme. However, one of my greatest concerns is that we are people who make excuses for our behavior, rather than admit we did something wrong or not well enough. Rarely do we look to ourselves when things go awry to determine what we could have done differently to achieve a better outcome. Parents whose child is a behavior problem in school blame the teacher claiming the teacher has poor classroom management skills. An elementary school child who looses a student council election declares that the election was “just a personality contest.” A high school basketball team might blame a game loss on the ref’s bad calls. A tennis partner blames her team member for the loss of a point. Underperforming sales reps blame their manager for their poor performance, and managers who are not making their quarterly numbers blame their lazy, unmotivated sales reps. Do you see a pattern here? I think one of the greatest gifts parents can give their children is the model of looking within oneself first when an outcome is less than anticipated. If parents modeled that behavior when talking about their jobs and what goes on in the community, perhaps children would get the idea and follow suit. We cannot always point fingers away from us, it is time to point fingers at us. I recently administered a personality assessment to my students. We discussed the virtues of each of the four possible personalities styles and then I asked the students to consider what might be potential drawbacks to their style. Where might they be ineffective at times? My intent was to get them to look at their own behavior and understand that sometimes what they say and do and how they say and do something is the reason that things turn sour. Women with high SUCCESSTROGEN are not pointing fingers at others, rather they look within. They “own their own stuff” so to speak. They know when their behavior resulted in a less than desired outcome. They look to themselves first, and only after that reflection do they look to others involved and evaluate what occurred. When they find that someone else in fact contributed to the imperfect outcome, they can approach the situation in a way to engage the other into understanding what happened and work towards a better future outcome. I imagine it is difficult for an egg to sit upright on a brick wall for any length of time. I, therefore, think Humpty Dumpty fell just because he was distracted, losing sight of being on a wall. I do not think he was pushed by some rowdy neighborhood kid, nor do I think he can blame his gymnastics teacher for not working more on his balance. No, I think Humpty Dumpty just plain fell. This entry was posted in Uncategorized and tagged blaming, Humpty Dumpty, inspirational message, nursery rhyme, owning your own behavior, responsibility, self improvement. Bookmark the permalink. marty Ann, I was one of your students about 5 years ago in Northern California when I was an SVP for First Data. You and your son taught the class–but mostly you. I love to hear people admit their mistakes, take responsibility for their actions and to be able to not take themselves too seriously. Your message above is spot on, in my view. I wish for you, continued success.